ICT minister Frank Tumwebaze (2nd right) with other officials inspect the site. Courtesy photo. The minister for Information Technology and National Guidance Frank Tumwebaze has today visited the proposed ICT innovation hub site in Nakawa. 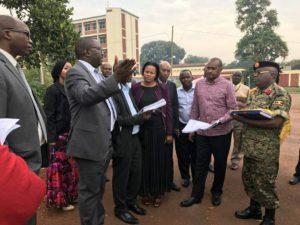 The hub that will be built by the Uganda People’s Defence Forces (UPDF) Engineering Brigade is in fulfillment of President Museveni’s directive to have a hub established in the city. An ICT information hub is a centre where people find the local information they need. The information is usually aggregated in one online source and pushed out via libraries in-person meetings, community radio, small run print publications and cable access TV. The minister was accompanied by the Minister of State for ICT Aidah Nantaba, ministry Permanent Secretary Vincent Bagiire, UICT team and UCC executive director, among others. ICT ministry Permanent Secretary Vincent Bagiire explains a point during the site visit.